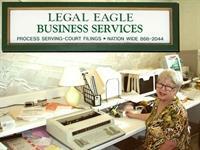 Owner Wealtha F. Weaver, purchased Preliminary Legal Services from an established Big Bear Lake paralegal in 2OO3 and changed the name of the business to Legal Eagle Business Services. She previously owned Big Bear Secretarial Services and Big Bear Employment. 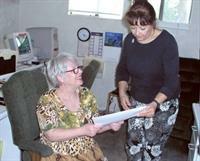 A former elementary school teacher, Wealtha Weaver holds a B.A. from The University of Southern Mississippi. With a variety of post graduate classes undertaken at UCLA, she also holds a degree in Litigation from The University of West Los Angeles School of Paralegal Studies, American Bar Association Certified. In addition to approximately ten years work experience as a legal secretary and paralegal, in all areas of the law, including riparian law, she holds a State of California Certification in Dispute Resolution from the L.A. Bar Association. It is the mission of Legal Eagle Business Services to provide superior legal document preparation for their clients, each client held in esteem, with one goal in mind, the pursuit of "Justice for All." The staff includes Connie who answers the phone, Cindi, assistant to Ms. Weaver who is also a process server, and Jessica, lead process server, both registered with the County of San Bernardino. Legal Eagle Business Services regularly provides eviction services to many local property management companies, as well as assisting landlords throughout California and the United States.